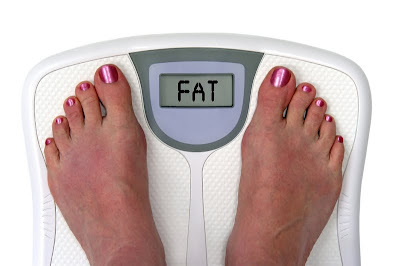 Ever step on the scales and feel like this is what it should be saying? Sadly, sometimes I think the actual numbers on the scale in essence say the very same thing. Or do they? Isn't weight one of those things that's so subjective that I look at one person and think they're not that overweight yet look at myself and think I'm morbidly obese. It's all about perspective, and sadly, our society has so shifted the thinking patterns of women that we almost altogether associate our weight (and our hair, clothes, & makeup) with our happiness. Even worse, now we're beginning to associate our weight with the spiritual condition of our hearts. Is there a spiritual aspect to our health? Absolutely. But to insinuate that gaining a pound here and there makes one less in tune with God is a bit far reaching. Might one who is obese need to consider better eating habits and the spiritual implications of their health? Yes, most certainly. But how about all the women out there who aren't obese but also aren't a size 2? The more I think about it, the more I realize that most women's' views on weight (beauty in general, for that matter) are solely formed on standards that society has made, not on Biblical standards that God set for us. While reading Biblical Womanhood in the Home by Nancy Leigh DeMoss of Revive our Hearts, I began giving a lot of thought about my views on what constitutes beauty. This quote particularly struck home: "The way we think about and attend to our personal appearance is really a mirror of our hearts. By reflecting either godly motivations or selfish motivations, we reveal whether our priority is to cultivate inner beauty or outer beauty." Wow. I know which mine often reflects and it's not the one it should be reflecting. Nancy lists a "heart check" test (from pg. 38-39 of her the previously mentioned book). See how you do. I know I failed miserably. 1. Do I spend more time daily caring for my personal appearance than I do in Bible study, prayer, and worship? (If you're like me and on most days you don't do anything other than shower and brush your teeth, then take a day that you actually do get ready and examine that or look at the time spent looking in the mirror, exercising, logging what you eat, etc.). 2. Do I spend excessive money on clothes, hair, and makeup, or is it an amount that is God-honoring? 3. Do I want to lose weight to "feel better about myself", or do I desire to be self-disciplined for the glory of God? 4. Am I on a quest for thinness to impress others, or do I seek to cultivate eating habits that honor God? 5. Do I exercise to try to create or maintain a "good figure" or do I exercise to strengthen my body for God's service? 6. Is there anything about my appearance that I wish I could change or am I fully grateful to God for the way He created me? 7. Am I jealous of the appearance of others or am I truly glad when I observe other women who are more physically attractive than I? 8. Do I covet the wardrobe of others, or do I genuinely rejoice when other women are able to afford and purchase new clothing? 9. When I attend an event or activity, do I sinfully compare myself with others, or do I go asking God to show me whom to love and how to do it? 10. Do I ever dress immodestly or with the intent of drawing attention to myself, or do I always dress in a manner that pleases God? (I might add here that even wearing things with the intent of seeking out compliments might apply - like new earrings, new shoes, new purse, new outfit. Not necessarily something immodest but something intended to draw attention to yourself instead of to Him). And then we do it all over again. Should we allow our weight to dictate our hearts? No. Rather we should rely on God for strength to help us focus on Him and what He wants for our lives! Our efforts at beauty should be more of a reflection of Biblical standards, not based on height-weight charts, models in magazines, or the abyss of Hollywood starlets. I find it interesting that God's definition of beauty is in stark contrast to what most of us consider beautiful. Nancy poignantly reminds us "Nowhere in the Bible are women instructed to wish for, ask for, or strive for physical beauty. Instead, God warns us of the futility and deceitfulness of such a pursuit..... However, there is a kind of beauty that we are to pursue. I Peter 3:4-5 tells us that our beauty 'should be that of your inner self, the unfading beauty of a gentle and quiet spirit, which is of great worth in God's sight. For this is the way the holy women of the past who put their hope in God used to make themselves beautiful.'" A gentle and quiet spirit. Hmm. Well, I have a lot of work to do. I'll be the first to admit that I'm not very gentle or very quiet. Yet those are the very traits that God says are beautiful, of great worth, and are unfading. And if He says it, I believe it. Now to the hard part - putting it into practice! Thanks for your wonderful Godly insight! Inspired me to be more in tune to what God desires of me.